Mika Brattain wins the National 8th Great Championships in Dallas! 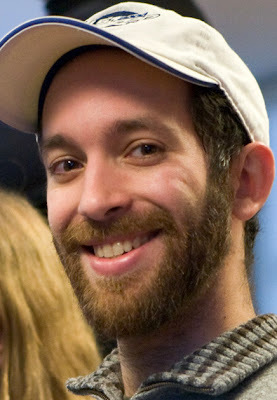 Mika at the 2010 BU Open, photo by Robert Oresick. 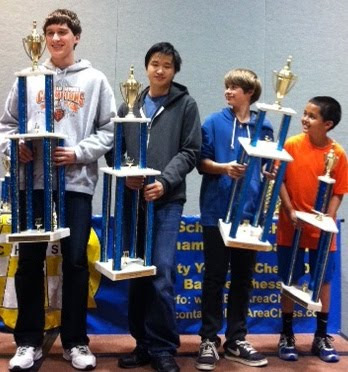 Boylston Chess Club member Mika Brattain took clear first by a full point in the 8th grade National Championships. Mika adds this title to his other national accomplishments, including his 2009 K-5 Super Nationals Championship. The penultimate Grand Prix event is coming to the BCC the Saturday after Thanksgiving, so mark your calendar for the cheapest chess around. For only $7.00 for members and $10.00 for non-members, you get 4 rated games. Also, if you are in shouting distance of the great year end prizes, you better attend-- with only 2 Grand Prix events left in the year, 8 points is the max you can score. The biggest shakeup is in the U2000 section, where Mike Griffin has leapfrogged over the higher rated to take first place. Harold Dondis has also positioned himself in 2nd place in the U2400, U2200, and U2000 sections. In the U1800 section, Robert Holmgren's previously unstoppable 20 points is now challenged by Mark Neale's 19 points. And Steven Stepak hold first place in the U1600 section, also challenged by Mark. 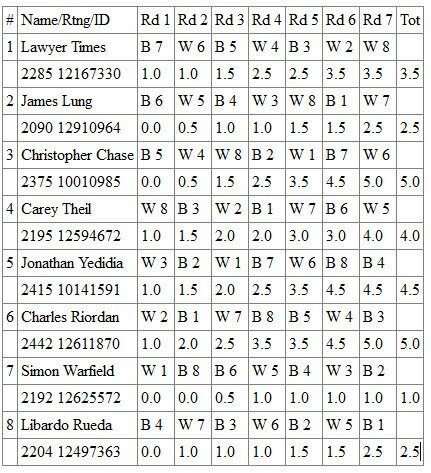 There are scenarios where Steven Stepak claims the U1800 prize and Mark Neale claims the U1600 one. In the U1400 and U1200 sections, Allen Wang and Arthur Tang hold the lead, but the Wu pair is making it a race in both sections. Stay tuned-- the prizes will all be determined in the last two Grand Prixs of the year!! $50 top BU undegrad Gil Coarrubias Jr. 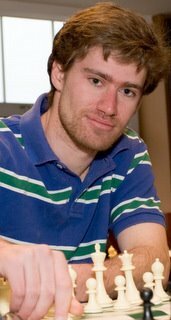 Check out BCC member IM Marc Esserman's detailed analysis of his brilliant win over GM John Fedorowicz in the US Chess League Playoffs. Unfortunately, the Boston Blitz team fell short in one of the nearest of misses, falling to the New York Knights' superior draw odds. Marc offers up many other chessic opinions for your entertainment. Max Lu is the runner-up in the US Jr. Chess Congress. Gina Chang shared with Bernardo the very good news that our long-time BCC member Max Lu had great success in CA. NM Charles Riordan has now won the BCF Championship 4 times. FM Chris Chase won the BCC Championship 8 times - more than any other player in the long history of the club. Charles and Chris split the 1st ($300) and 2nd ($200) prizes and will play an Armageddon match for the sole free year-long entry. IM Jonathan Yedidia took 3rd place and $100. Red Line Repairs in Effect! Just a reminder: For those coming to the Boylston Chess Club Quads this weekend - and any weekend tournament during this winter - please remember that the MBTA Red Line is now stopping at Harvard Sq. Station in order to do track repairs during the weekends. Shuttle buses between Harvard Sq., Porter Sq., Davis Sq. and Alewife are available and do work - I used them last weekend - but they are slower than the regular subway, so please take this into account and add at least 20 minutes if you're getting to the Club via the T due to traffic, weather, etc. Do come to the Club soon to see our magnificent, brand new wooden chess sets that were generously donated to the Boylston Chess Club by Dan Schmidt! Thanks to a generous donation from Boylston Chess Club member Dan Schmidt, the club has a new look and feel-- the entire playing area is now stocked with beautiful House of Staunton wooden chessmen. 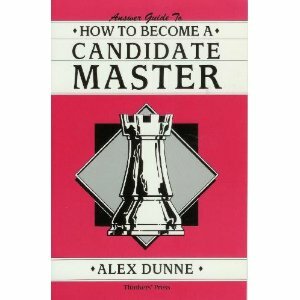 No more random assortment of off-White rooks and pawns. Now you can make your tactical combinations with an extra sense of style. We at the Boylston Chess Club are always looking for ways to improve the chessic experience in the greater Boston area. We hope these new pieces will enhance the quality of our membership. New England Nor'easters Play for a Playoff spot, WEDNESDAY! 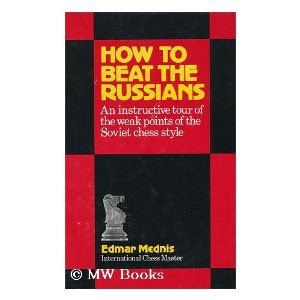 Dear fair weather chess fans! 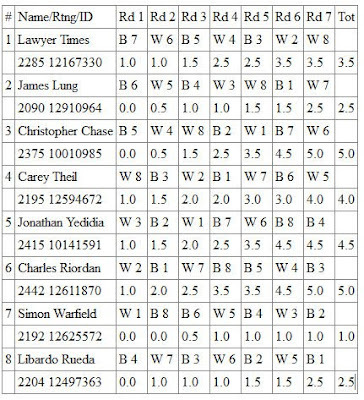 Let's face it-- you haven't been watching the US Chess League this year like you did in the past. 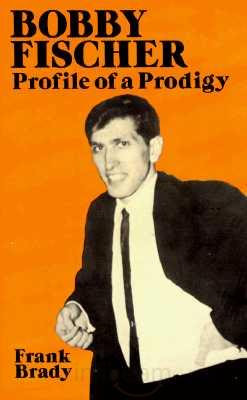 The Boston Blitz hightailed it to Providence, R.I., effectively destroying their fanbase. 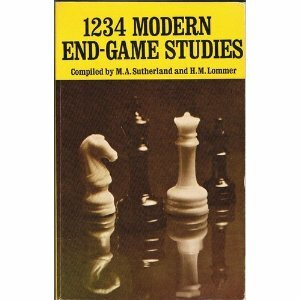 It didn't help that IM Esserman's games involved 3 draws, not a psycho-gambit in the bunch. The New England Nor'easters followed up their amazing undefeated season by failing to win in their first 4 matches. So you cut and ran. I get you. The Red Sox imploded and after four hours of 'breaking news' interviews with Epstein, Grady Little (Whoops! I meant Francona), and the binge drinkers in the bullpen, you are likely fed up with any more baseball. If you thought Tom Brady must have watched Tim Tebow's game tape for pointers before he got manhandled by the Pittsburgh Steelers this weekend, you probably can't stand any of the National Concussion League. I guess you could watch thrilling coverage of the NBA lockout. Or hockey pre-season games--there is always the, ahem, Bruins (who, even as Champs, will never fire up these ice hockey veins). Or! Or! Or! You could come and watch the New England Nor'easters at the Boylston Chess Club on Wednesday at 7:30PM as they enter the final game with a chance at REDEMPTION! COMEBACK! PLAYOFFS! GREATNESS! Doin' a little Moneyball math, we can see that the New England Nor'easters have a slight ratings edge on the Baltimore squad. Furthermore, I'm quite sure that both Hungaski and Shankland have very impressive Win Shares, if I knew how to calculate that stuff. After watching Brad Pitt lead a scrappy Oakland team to a scrappy loss in the playoffs back in '01/'02, I also know that FM Bournival has a high On Base Percentage, which, I'm told, is the key stat that wins games, which is why Scott Hatterberg made the highest salary in baseball back then. Another key factor for those A's was that side-arm pitcher with the wacky knuckledragging, almost underhand, toss from the mound. Maybe Mika still has time to alter his pitching mechanics for this all-important game-- 1.h3 anyone? Why don't you come cheer on (quietly, let's not distract them mid-move) the New England team on Wednesday? As usual, we will be projecting the games onto the wall. 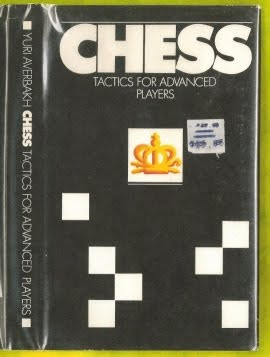 Lots of us will pretend we know something about chess while some resident masters give us the real scoop on all the action. You better show up now, or you will be mighty embarrassed during the playoffs when you pretend you were a fan all season long! Show up Wednesday night for a little fair-weather camouflage. These guys are the Nor'easters-- they are all about rain and sleet and days off work and that nasty stuff we had last weekend.